Predominantly, we all (engineers, architects, tradesmen, designers and product suppliers) work from the fabric of the building or enclosure through to the fit-out of the interior. Therefore SBID is keen to promote competence & education as core values of interior design from construction, planning and product knowledge-share through to fit-out and completion. We have a long way to go, we do not intend to conquer the world, but we are built on a strong foundation to become a leading authority for UK, Europe and leading countries in property construction and investment. SBID turns three years old this month and we are on course to affect the policies we laid out in our business prospectus which we registered at Companies House when we were formed. Under the Freedom of Information Act, an alternative design organisation requested and received our business plan and structure on three separate occasions. It doesn’t help to copy, even with the plan! I own an excellent recipe book, but I can not make an apple pie! What do you gain with information data grab if you don’t fully understand its value? We find in many far eastern countries, our products are duplicated to lesser standards and quality, but plagiarised they are! This led to many faults and complaints in quality default by end-users in fit-out and that led to an abundance of complaints which effects and impacts on our industry sector. So through the last decade of greed and show-off wealth we learned that any growth industry built on sand….is unsustainable. If nothing lasts cheap is not cheap when looking at longevity, performance and brand value. The only thing saved in that cheap ‘gimme, gimme, gimme’ era was reduced capitol cost. Labour costs of course eat into any savings and so we have learned at a massive cost not to begin or attempt any project without assembling the correct team and sufficient funding. History belies the mess we can get into with insufficient funding and inadequate standards or regulations in place. We may not like regulation, but it is the key performance factor that brings a wealth of investment into Britain from international shores. Security in the knowledge that the investment is safe. In this regard, Andy Davis of KBB Review called a meeting a year ago and invited industry organisations to pool our resources and improve industry image and delivery. 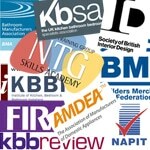 Sixteen organisations agreed to create the KITCHEN & BATHROOM FORUM with the objective to improve the industry image through standards. SBID is the organisation representing interior design and FIRA is the furniture organisation representing ‘fit for purpose’ knowledge. Working together we aim to ensure that our design members are cognisant of the scientific, technical, compliant integrity of specified products to ensure that our members selling advice to their clients and recommending products, do in fact recommend the correct product for use and environment in which the product is being installed.